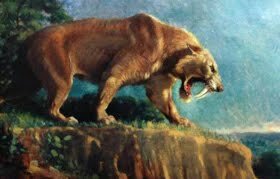 Commonly called the sabertoothed tiger, Smilodon fatalis was a large predatory cat that roamed North and South America about 1.6 million to 10,000 years ago, when there was also a prehistoric cat called the American lion. A study appearing in the November 5 issue of the Journal of Zoology examined size differences between sexes of these fearsome felines using subtle clues from bones and teeth. The researchers report that while male American lions were considerably larger than females, male and female sabertoothed cats were indistinguishable in size. The findings suggest that sabertooths may have been less aggressive than their fellow felines, researchers say. In species where males fight for mates, bigger, heavier males have a better chance of winning fights, fending off their rivals and gaining access to females. After generations of male-male competition, the males of some species evolve to be much larger than their mates. Most big cats have a form of sexual dimorphism where males are bigger than females, said co-author Julie Meachen-Samuels, a biologist at the National Evolutionary Synthesis Center in Durham, NC. So she and Wendy Binder of Loyola Marymount University in Los Angeles wanted to know if extinct sabertooths and American lions showed the same size patterns as big cats living today. When it comes to fossils, sorting males from females can be tricky. "It's hard to tell who's a male and who's a female in the fossil record," said Blaire Van Valkenburgh, a biologist at UCLA who has studied these animals extensively but was not an author on the paper. "Unless you're lucky enough to get some DNA, or you're working with an animal where males have horns and females don't." For species that keep growing into adulthood, simply separating the fossils into two groups by size may not do the trick, either. "It's easy to get a younger, smaller male confused with an older, larger female if you're just dividing them by size," Meachen-Samuels said. The researchers accounted for continued growth using subtle clues from fossilized teeth. "Teeth fill in over time," said Binder. "In young animals the tooth cavity is basically hollow, but as they get older it fills in with dentin. It won't give you an exact age, but it can give you a relative age in terms of young, middle aged or old," Binder added. Meachen-Samuels and Binder x-rayed the lower teeth and jaws of 13 American lions and 19 sabertoothed cats recovered from the La Brea Tar Pits in Los Angeles. To account for growth over time, they measured tooth cavity diameter and plotted it against jaw length for each species. Plotted this way, the data for the American lion fell easily into two groups, regardless of age. The researchers concluded that "the little ones were females and the big ones were males," said Van Valkenburgh. In contrast, sabertoothed cat sizes seemed to be governed solely by age. It would appear that the males were indistinguishable from their mates. "Even by incorporating a measure of age, you can't distinguish males and females," said Meachen-Samuels. Size differences between the sexes tend to be more impressive in species where male aggression is more intense, and in the extinct American lion, size differences between the sexes were even more dramatic than in lions living today. The closest living relative of the American lion, "African lions engage in aggressive takeovers where one to several males will take over an entire pride – the males have battles to the death," said Van Valkenburgh. "Living lions have huge sexual dimorphism," said Meachen-Samuels. Based on their findings, the researchers think the American lion probably lived in male-dominated groups, where 1-2 males monopolized and mated with multiple females. "My guess would be that the American lion was similar to African lions, where males guard groups of females," said Meachen-Samuels. "But we don't see that in the sabertoothed cat," Binder said. The size similarity in sabertoothed cats suggests that male sabertooths may have been less aggressive than their larger cousins. "Rather than males having harems of females, the males and females in a group might have been more equal," Binder said.